Jordan Erichsohn suspects something is rotten about his boss, Judge Crawford. Unfortunately he has nowhere to turn and doubts anyone will believe his claims—least of all the handsome deputy, Pierre Ravelle, who has been assigned to protect the judge, as he's been receiving the threatening letters. The judge has a long reach, and if he finds out Jordan’s turned on him, he might impede Jordan adopting his son, Jeremiah. Jordan is just trying to make it through to the finalization of his adopted son. He wants to keep his head down, do his job, and not make any waves. This is especially important because he works for a judge who is known for being very hard on criminals and harder on those he believes betrays him. Judge Crawford is a trying man at the best of times. But now, with threats coming in to his office, he is more on a war path – making sure his bench position stays safe. Pierre is an officer who is responsible for making sure that Judge Crawford's court room stays safe for him. However, Jordan catches his eye and he begins to court Jordan, despite knowing that Judge Crawford might not like it. When things heat up both between Jordan and Pierre and Judge Crawford, this story will take twists and turns that are fun to watch unfold. I hope more is to come from this series. 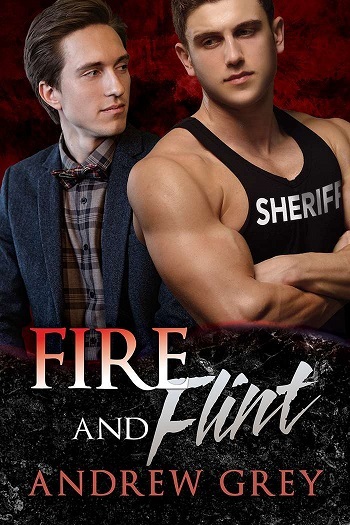 Reviewers on the Wicked Reads Review Team were provided a free copy of Fire and Flint (Carlisle Deputies #1) by Andrew Grey to read and review.